The Sussex County Parkinson’s Education and Support Group presented a check for $6,000 to Beebe Medical Center. Pictured here, left to right, Graham Robbins, Director of Beebe Medical Center Rehab Services, Mary Green, Director of Development at Beebe Medical Foundation, Dennis Leebel, Group leader; and Cheyenne Luzader, Coordinator of Integrative Health for Beebe Medical Center. 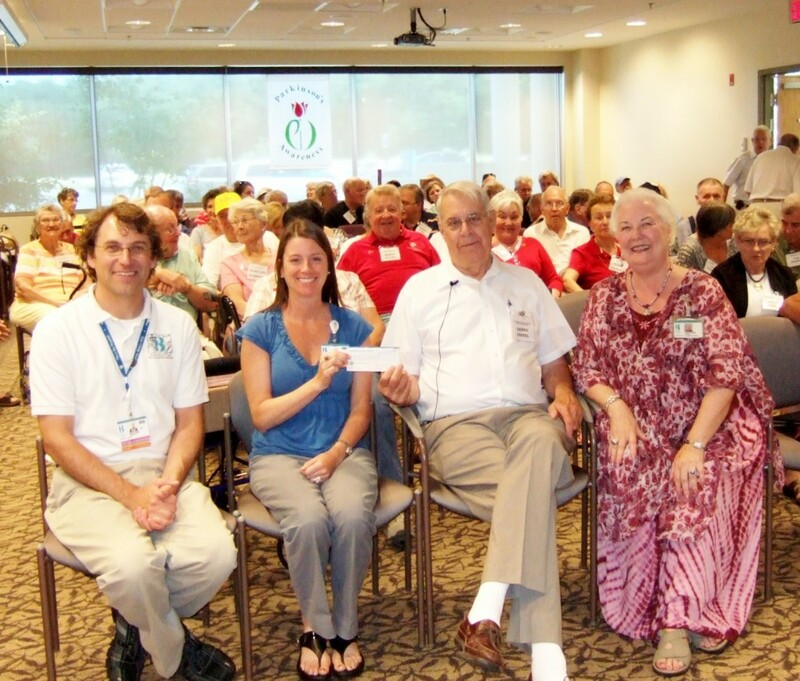 The Sussex County Parkinson Education and Support Group has donated $6,000 to Beebe Medical Center. The donation is earmarked for Beebe Medical Center’s Physical Rehab Services and for Integrative Health, both of which offer services that help people with Parkinson’s disease. Support group members raised the funds through two recent efforts. They co-sponsored, along with Beebe Medical Center and its Integrative Health program, and the Delaware Department of Social Services, a seminar on April 28 at Cape Henlopen High School, entitled Complementary and Alternative Medicine (CAM) for People with Parkinson’s and Other Movement Disorders. On May 21, they held a successful Silent Auction in Millsboro at the Blue Water Grill Restaurant. The support group plans to continue to work with all the area hospitals to improve staff understanding and treatment of people with Parkinson’s. Accepting the donation was: Mary Green, Director of Development, Beebe Medical Foundation; Cheyenne Luzader, Coordinator of Integrative Health, Beebe Medical Center; and Graham Robbins, PT, Director, Rehab Services, Beebe Medical Center. Beebe Medical Center’s Integrative Health program, which also received a part of the donation, offers movement meditations such as tai chi and qigong that help with muscle strength, balance and flexibility. The program also offers Reiki, guided imagery and other relaxation therapies. For more information, call (302) 645-3528.